What is ERP? How does it help in business development? An ERP solution mainly refers to the solutions, software packages and systems implemented by the companies to improve everyday business activities, like procurement, accounting, management and manufacturing. ERP solutions help businesses to be able to collect information from all important areas of the company with the purpose of refining effective decision making and making it easier for management. ERP solutions support transparency throughout the entire company, allowing the top management to improve important business areas. Nowadays ERP solutions are the key for management of thousands of businesses effectively and efficiently. For many companies, ERP implementation is as indispensable and very important to grow your company into greater heights. ERP for small business is especially critical because it helps management in making the right decisions. What are the biggest advantages of implementing ERP solution into your business? ERP helps your business to gain credibility by effortlessly connecting you with the customer, vendors and so on. ERP helps you connect with all employees that deliver you with detailed reports in every aspects of your company. ERP enables improved reporting and planning because of easy availability of data. Can help save money over the long run of the business by streamlining processes. Jetz ERP system is tailored specifically to meet the unique and special business needs of our clients. We understand how important ERP implementation is for small business and we work hard in creating the right ERP solution for your business. 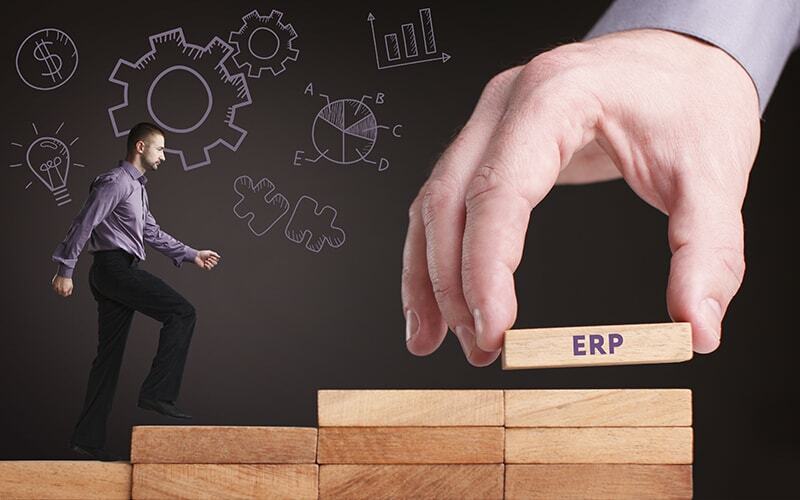 If you are implementing your first ERP software system or you are replacing a legacy ERP solution, it’s likely every company no matter the size will experience major challenges. ERP integration into your business is a complex and difficult process and there are bound to be many difficulties. It requires proper and detailed planning from the pre-implementation stage to the stage where you look to improve the already implemented ERP solution. The implementation is made easier by breaking up of the plan into stages, Thereby reducing the challenges faced during ERP implementation can be kept minimal. This category of ERP solution on premises or Legacy based ERP systems are always implemented for companies who are keen on data ownership. It cost high during setup and maintenance. This type of Cloud based or web based ERP or Software-as-a-Service (SaaS) ERP implementations focus on ERP software applications that are hosted by the ERP provider or vendors external database or servers. The exclusive advantage with this kind of ERP solution is the ability to have a working ERP up and functioning in no time. This type of ERP also includes automatic upgrades and also reduction in hardware and support costs. This type of Cloud hosted ERP solution allows companies to take proper advantage of storing the data in cloud through the use of remote data storage service provider. The major advantage of having this type of ERP solution is that this has the capability to also move all ERP data storage to the cloud or operate as a two-tiered ERP system, where you have the data stored in both on-premises and /or in the cloud. Some of the benefits are greater mobility, improved data recovery services, and reduced costs. Choosing ERP solution designed for your specific business type or industry, and checking that the ERP vendors have knowledge of specific issues pertaining to the business, can lower the risk for your organization. Make the necessary time and investment for choosing and implementing the ERP solution. Making hasty decisions by just goggling top ERP systems will not be a wise move to improve your business. Put together a checklist of important points to concentrate on while choosing the ERP system and while implementing it. It is always advisable to keep track of each and every step of the implementation process. Put together a cross functional team from your employees to oversee and take care of ERP implementation. Having the right people with the skills required on the ERP planning and implementation team is the key to a successful deployment of ERP solution. Make the implementation a step by step process. There is no need to take a hurried approach and mess up the process. Implement ERP solutions in a phase by phase approach. Train the staff. Change is always tough. Any new system will cause staff to panic and cause problems in the implementation. Manage chaos by conducting training sessions to train staff on the ERP solution that is to be implemented. Have a test run before going live to the entire company. Choose a department to have a test run in and ensure the process it smooth there. Make proper use of the vendors. Most vendors provide constant support during and after implementation of the solution. Ensure that there is proper support clause in the contract and make best use of the vendor help. We recommend Jetz ERP system that caters to all your needs listed above.